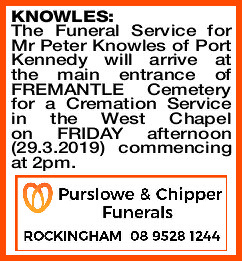 The Funeral Service for Mr Peter Knowles of Port Kennedy will arrive at the main entrance of FREMANTLE Cemetery for a Cremation Service in the West Chapel on FRIDAY afternoon (29.3.2019) commencing at 2pm. To my Darling Husband Peter, the day you went away my heart was torn in two, one side filled with heartache the other died with you. I will always love you. Till we meet again My Love.